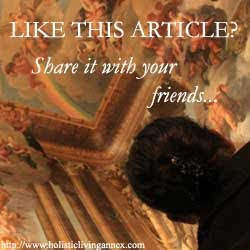 Holistic Living Annex: I Saved My Career and My Family! I Saved My Career and My Family! Hi! I'm Emily and I'd like to share my story. I didn't know whether to post this story in the book's page or to e-mail this story in to be listed under the mastermind category, so I am doing both. To begin with, I hated my job! I hated everything about it from the working hours to the discrimination I experienced at work. I thought I couldn't blame myself because I felt as though I was forced to do it even though I clearly didn't like it. You see, I have to feed my family. I have an old dad at home who cannot work no more and I have a 10-year-old son whose father left him 3 years ago. I was a young single mother who had no choice but to work to support this family. It's not surprising that I had all these anger and vengeful feeling boiling deep inside of me. Eventually I suffered from low self-esteem as well because I just saw more and more injustice around me. Why is it that people can go home to a happy family and I didn't?! Or at least, I thought so. People always criticized me because they saw me as a young single-mother who didn't know how to be a mother. I was judged everywhere I went. They always told me that I was incapable of raising my child alone. I had to either get married or just put my child up for adoption. Obviously that was not what I wanted! I became hateful and I was very unhappy. I had to juggle between work and taking care of my family. I'm not very highly educated as well and I was very conscious about what other people thought of me. Having a kid without a husband made it much harder for me to cope. I cursed myself and I wished I could die!! Being one of the youngest workers in the company made my voice and opinions unappreciated too so much so I have stopped trying to change the company lest they label me again for trying to 'rock the boat'. My manager said to me few months ago that I should just do my job quietly and not try to shine in places where I was not wanted, and that I still had a long way to go! But I really believed that my suggestions would benefit the company. Aren't we all supposed to play our parts in an organization? She even threatened me that my job was at stake if I didn't step back? So I just let it go. I did what was required of me, but I wasn't at all 'shining'. With her around, office really was like hell to me! A very dear colleague knew that I was feeling so miserable due to all the challenges in my life that she asked me to start meditating to calm my mind. I thought it was silly but I really needed something! I was losing my mind!! August last year, I googled to see how to meditate and that was how I came across this site. I was finding out the reasons why people meditate and somehow the universe must have thought that I should take a look at this site. I really love reading the articles here. When the article on the art of war book came up, I decided to purchase one from amazon.com. When it arrived, I finished reading it in a couple of days and I loved it. I've always been battling with myself and I didn't even know it! 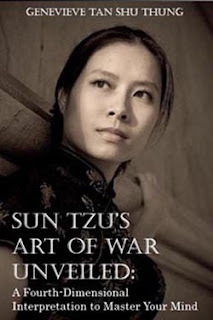 Page 129 of the art of war book (Sun Tzu's Art of War Unveiled) is my favorite! It states there that "when you come face-to-face with people who challenge your views and beliefs, do not feel threatened or confined by their judgements. You do not become stupid simply because others say that you are." I've always felt intimidated or challenged whenever someone labelled me. But why should I? That instant I read that, it was sort of a bang in my head. I didn't need to care what others thought of me. After all, Genevieve wrote on the same page that "the fault of an unfulfilled dream does not lie with circumstances or the people whom you meet along the way, but with a defective inner vision." I decided there and then to focus only on the good stuff in my life - stuff that I had overlooked for years, not even realizing that they were there all along. I tried to list all the good side of things just like the book said. I thought I didn't have a great job at that time but hey, I HAD A JOB! There are people without jobs who sleep on streets! I didn't have a husband (and I still don't! ), but I have a father who encourages me to live my life as happy as I can and I have a beautiful son who loves me and waits up for me whenever I came home late from work! I cannot afford all the luxuries other people have but at least I still have a roof over my head! I have so many things to thank for that I never noticed before. I'm young and though I do not have high qualifications, I have two hands and a perfectly functional brain to work with. I also used the steps in chapter 13 to direct my mind in the correct way to manifest my vision. I wanted to be the star salesperson of that month. Every star salesman/saleswoman will get a special silver star clip that he/she must wear to the office daily to remind others of the company's recognition of their hard work. Even though that seemed like a petty wish, I really wanted to wear that silver clip because I wanted to know that I was appreciated in the company. At least, I would know that I am appreciated for something!! At the end of the month, I got that silver clip after all. My colleagues thought I worked so hard that month to get my sales up but I really didn't do anything different than I did before. I didn't do more marketing or approached more people. I simply saw myself wearing that silver clip and feeling so appreciated by my company! I went to work and left work happily every single day. I enjoyed my time with my dad and son the best way we could; the most important thing was for us to all laugh and just have a good time. Somehow, random people just started chatting with me and asked me what I did for a living and when we were done with the conversation, they just ended up buying the products! Just like that! It didn't even take any extra effort. I think all these happened because I was not dreading about my job anymore. I began to appreciate what I had and so I had to have more. The universal law gave me just that in the form of the silver clip I had wanted so badly! And guess what? Due to some undisclosed reasons, my company fired my manager few days ago. Now, I'm training my son to be the next warrior of the mind so that he will have a magnificent life ahead of him. You're on your way to shine brighter than ever Emily. Keep up the faith. God bless you, your son and your dad. Your manager must be wondering what hit her!! Life couldn't be better with the proper use of the subconscious mind! I'm happy for you Emily. You did very well! Oooh boy. It's out already???? Thanks guys. I hope to share more stories in the future. I'm working on something really special right now. Will keep you posted! I'm lovin' this site already. I love all these law of attraction stories. They put a smile on my face as I look forward to achieving all my dreams. Anything is possible man! You rock gurl! !